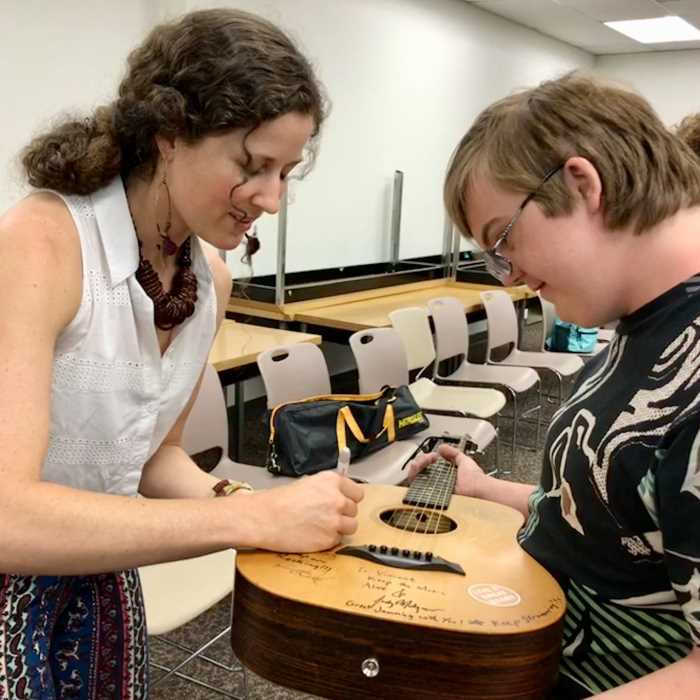 EcoArts founder Ashley Mazanec signs guitar at Banding Together San Diego, a music program for special needs individuals. Founded in 2009, Banding Together’s mission is to bring music opportunities to individuals with special needs in our community. This is accomplished through key objectives that include providing: music therapy scholarships, free Jam Session programs, mentorships, and instruments. To date, we have awarded 79 music therapy and adapted music lessons scholarships totaling $48,140. Since 2012, we have reached 158 individuals aged 13-24 in our Jam Session program, 56% who have autism. Unfortunately music-making experiences may not be available to individuals with special needs such as autism due to lack of financial resources. Often after age 22 the number of supported social and recreational services are very few. According to the California Department of Education, in 2010 there were approximately 57,273 individuals with special needs in San Diego County. Of that total, 23,544 are within are range of our programs.